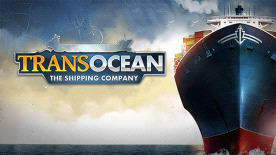 Painstakingly crafted harbors based on real-world models as well as realistic ships and routes make TransOcean – The Shipping Company a unique gaming experience. An elaborate trade system with dynamic prices allows you to constantly keep an eye on the most lucrative routes, as this is the only way you can secure the best jobs. Try to keep a balance between expenses and profit, and keep your nerve when you have to choose between different possibilities: would it pay to smuggle goods, or would you risk your good reputation? Then consider that the more successful you are and the better your reputation is, the better the offers you will receive. In online mode, you can compete with other players for the more lucrative routes and the best prices; the law of supply and demand applies in this case. Numerous paths can lead you to your goal – find the right strategy to continually expand your empire and become the most successful transport company of all time! © 2014 astragon Software GmbH & Deck13 Hamburg. Published and distributed by astragon Software GmbH. TransOcean, astragon, astragon Software and its logos are trademarks or registered trademarks of astragon Software GmbH. Deck13, Deck13 Hamburg and its logos are trademarks or registered trademarks of Deck13 Interactive GmbH. All rights reserved. All other names, trademarks and logos are property of their respective owners.